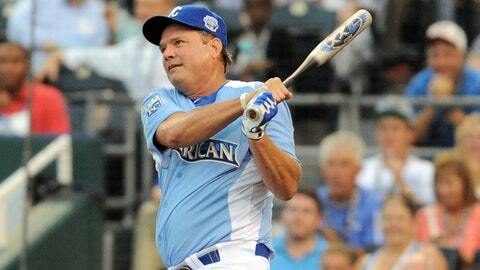 Check out that swing by Bill Self! Kansas will move a preseason exhibition basketball game if it appears the matchup could conflict with a World Series Game 7. The Jayhawks are scheduled to play Pittsburg State on Wednesday at 8 p.m., a few minutes before a seventh game between the Royals and New York Mets would start. To minimize confusion, the basketball game would be shifted to the following night if the Series is extended to six games, ensuring a return to Kansas City. "We love the roll the Royals are on, and we know that interest in this Series is sky-high in this area," Jayhawks coach Bill Self said Friday. "Many of our Jayhawk fans will want to attend or watch Game 7 next Wednesday, if it goes that far, and we don’t want them to have to make a choice." Edinson Volquez, who made his Game 1 start Tuesday night, hours after his father died, should rejoin the Royals in New York on Saturday. Volquez said he learned about his father’s death when he stepped off the mound after allowing three runs over six innings. He then flew home to the Dominican Republic. "Yeah, he’s still slated to pitch Game 5," Royals manager Ned Yost said. "We should see Eddie tomorrow. He’ll be ready to go." Volquez’s father, 63-year-old Daniel Volquez, died of heart failure.